If you were hoping that this column would see me go out in a blaze of glory and dish up the dirt on all and sundry, you’re going to be disappointed. If you were hoping for a lengthy story of my life in Thailand and the history of this column, you’re in for a disappointment because that won’t appear this week. And if you were hoping that after today you’d regain 20 minutes of your Sundays from now on, you’ll probably be disappointed too. Today’s column is not the final Stickman column. Talks have been taking place behind the scenes….and that’s all I can say about that at this stage. I don’t wish to be coy and the truth is I really don’t know exactly what is happening myself. As soon as I know more and things become clear, I’ll tell you. 24 hours ago the goodbye column was finished and ready to be published on Sunday. I really believed the final Stickman column was going to be published today. It seems it’s not quite goodbye yet. Call it what you will, a stay of execution perhaps. Last week’s photo was taken on Patpong soi 1, of course. 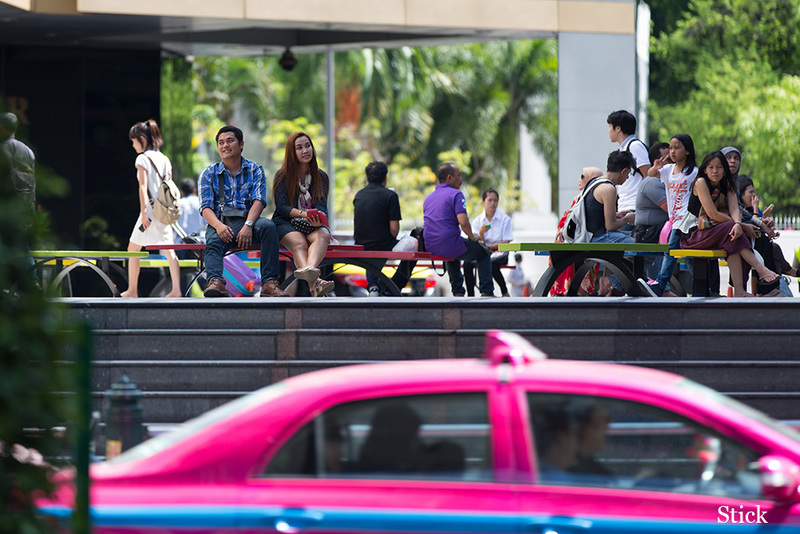 This week’s was taken in a high-pedestrian area in downtown Bangkok. * Due to me thinking today’s column would be the last, this section features more emails than usual. The old bus and the hill. Surprised to hear that next week will be your last column. But I understand that when it is time to move on, it is a wise man who was happy for the ride but that old bus just doesn’t make it up the hill like before. Time to get out and walk. Bangkok is unrecognizable from 30 years ago. No one ever mentions the double whammy culture shock of living abroad: the first shock of arrival and settling in, and the second shock when after years the place you arrived and settled into has vanished. The latter happens over a long stretch of time. It is only much later when you look back it hits you – the place you called home disappeared and you are once again a stranger. What is the majority owner thinking? You must be getting a lot of emails re the site closing down, so I will be brief and say how disappointed I am that the new owner has deemed it fit to be shortsighted in coming to this decision. I for one will miss your observations which rightly so at times flew in the face of majority opinion. I thought the site was just maturing into something that could have been extremely interesting. Let me add my voice to the chorus of OH NO! It’s like someone buys your favourite restaurant or hotel and then proceeds to knock it down. It will be a huge loss and the end of an era but then Stickman is not a collaborative URL, it’s a person and it’s a pity the owner didn’t realise that. Stickman began and ends with you. If you do wish to keep blogging I am sure there will be many of us who will keep on following. Sunday just won’t be the same. I’m absolutely gutted it will be your last column next week. I discovered your column about 6 years ago and have really enjoyed reading it on a weekly basis. I’ve used your column to guide me and I’m so glad I did. I have looked forward to every Sunday to find out the latest news and views of what’s going on. Although I have only contacted you on one occasion before, asking for advice regarding my (now) ex Thai wife, I have loved every aspect of the column each week. So I just want to say, you and your column will be very much missed indeed. It’s been great, and my Sundays here in the UK will be a much duller place, if that’s possible, not reading your weekly piece. I wish you all the best for the future, and thank you once again for making my Sundays feel like I’m back in Bangkok. Sorry to learn of impending demise, but glad the site will still be available. Like many, I suspect bluff on the part of the majority owner. If so, he must have underestimated you, and I entirely agree with your choice of action even though it must be a disappointment. If it’s not bluff, has there been mismanagement? Times are changing however, and it’s harder to make a buck these days. The Stickman era is over. End of an era then, rather like when they stopped Night Owl, but I always thought it would be best for anyone going home for keeps to put Thailand firmly in the past. Vlogging on YouTube seems to be very popular these days. You could consider something along those lines maybe, if a new site is too much hassle. Loads of people will miss you and those that slagged you off will be harking back to the good old days of Stickman in no time! You were probably too nice a bloke and too honest to make it really big in Thailand. You decided you were done in 2015 and stretched it out another 2 years. You sold your asset instead of letting it slip away and squeezed another couple of years’ income out of it. That’s a South-East Asian success story. Write a memoir, or put together a book. Seven dollars for a Kindle on Amazon has got to generate some income. You could easily tap into your archives and pull out a treasure trove. What ever you do, or what ever the next chapter holds, you will be glad the weight of the world is off your shoulders and you can operate at your leisure. Best of luck on your next endeavor. I have read the Stickman column from the first edition to the last, unless I have been in prison where internet was unavailable or in Starbucks where it was blocked. What made Stickman as good as it was? Possibly the photography which was professional standard, but that wasn’t it for me. Neither was it the emails or readers’ submissions or the majority of the site. All of the site was good and I enjoyed it all, but for me it was the fact that it was written like a book. Imagine Harry Potter was real, that you could actually visit Hogwarts and meet Harry and the rest of the people from within the pages of the novel. For me that’s what Stickman did. You made life in Bangkok read like an exciting, fast-paced novel replete with larger than life characters like Dave the Rave, Lecherous Lee, Harry from Tilac and so many others. To actually visit Bangkok and meet these people for real and even Stickman himself, I understood just how real and accurate this column has been. There has been no better nor more accurate portrayal of life in Bangkok than that given by you, in fact it was accurate enough for several bar owners to be very upset at your honesty. Stickman will be missed by more people than you realize. I am happy to have been able to enter the world you so wonderfully depicted and to call you a friend. Very sad to know about the future of the weekly column. My Sundays will never be the same again. Most importantly, a distinctive side of Bangkok and Thailand will be lost forever with the sunset of your column. My personal favourites have been the stories about people, and the photo essays, as those are unique to this column. However it is really amazing how you’ve been presenting a very palatable view of nightspots like Soi Cowboy, Nana Plaza, and lower Sukhumvit area, week after week. I’m not much of a bar hopper anymore but every time I read something interesting in you column, or saw a photo essay about a bar, I used to pay a visit and have a few pints there. In that sense your column has been a free advertisement of those two areas as a whole. Knowing when it’s time to say goodbye. It’s odd – the sense of nostalgia that washed over me at your news. But life is about meetings and partings; beginnings and endings where nothing lasts forever. Thailand is the perfect metaphor for all of that. So congratulations on a long, successful literary run and good luck to you as you turn your sights toward the next chapter of your life. Your memories of Thailand should be fairly easy to preserve as they’ve been codified for years, one week at a time. Not many could have made that kind of commitment to a business such as yours, even if they considered it a labor of love as you did, (at least for a while). I guess the day we all feared would come has finally come about unless a miracle happens. You have done all that is humanly possible to keep the dream alive but we all must face the reality that Thailand is rapidly-changing and nothing will soon remain of our golden period in our Land Of Smiles. Too many changes are happening in Bangkok to shake the belief that we can do the things we have done for so long in Bangkok. The places we loved are fast-disappearing, even the street food vendors are disappearing. Markets are being relocated and our old Australian Embassy is being relocated in to a new building on Wireless Road. I was planning to go back to Thailand and spend my declining years in the city that I call “My Beautiful City”, my lovely Bangkok. But, from all that I am reading of the undesirables now inhabiting large parts of places we all frequented for years, I don’t think I would like Bangkok now. My last visit was for Christmas, 2013, and the city was under siege from protesters who were running protest sites aimed at inconveniencing all and sundry – and causing many small businesses to go to the wall. That was not the Bangkok I know and love. When I first went to Bangkok in 2000, it was like a piece of Paradise – and it truly was “The Land Of Smiles”. * Photos kindly provided by the Nana Plaza marketing department. Flann O’Brien’s, the Irish pub on the corner of Silom Road and Soi Thaniya in the space that was long home to O’Reilly’s, will close tonight for the last time. The English version of the boring game resumes tonight and Stumble Inn (on Soi Nana, out front of Nana Plaza) will show the FA Community Shield match between Arsenal and Chelsea live from 8 PM. Pints of Tiger and Chang are 100 baht during the game. At Dollhouse in Soi Cowboy, happy hour starts at 6:00 PM and runs through until 9 PM. The patio bar is open from 6:00 PM and the gogo bar inside gets going with dancers on stage at 7:30 PM. There are some decent happy hour deals including Canadian Club and most beers for 110 baht. For those on a budget, some drinks are 95 baht. A new bar has opened on On Nut by soi 16 called Grumpy’s Grill. It aims to bring Farang (Expat) food to the area, particularly the increasing number of Westerners resident in that part of town. As an opening offer, Grumpy’s Grill is doing buy 3 bottles of Tiger, get 1 free. Small bottles are 80 baht, large 120 Baht. There will be monthly specials posted on the Grumpysbkk Facebook page. The low season is generally considered to be from the end of Songkran until November with a spike in July and August as Europeans descend on Thailand for their summer holidays. Word is there has not been much of a spike from European visitors this year so it could be a quiet run in the bars from now through September (typically the 2nd quietest month of the year) and October until things start to pick up when the weather improves in November. October was always my least favourite month of the year in Bangkok because of the very heavy rains and while it might sound like fun to visit when the crowds stay away, October would never be my first choice or to put it another way, only April is a worse month to visit, in my opinion. November, especially from the middle of the month onwards, is usually much better weather-wise. From two Bangkok bar bosses comes comment this week that the number of Japanese visiting the gogo bar areas has been in decline for a while. Those bars the Japanese are known to frequent just aren’t seeing the numbers they used to. Whether this is due to the Japanese losing interest for the same reasons as farangs (higher prices for drinks and barfines, poor attitudes, more girls who cannot be barfined), or whether there is another reason, I have no idea. Speaking of drinks prices, what do you think of paying 160 – 200 baht for a drink in a small gogo bar which has a dozen or so dancers – and probably no more than 4 on stage at any one time – which is the same amount you pay in a large bar with 100+ girls and 30+ on stage at any one time? Does it make sense for a customer to pay 180 baht or so for a beer in a small bar when there’s so little entertainment? Sure, some small bars have a certain appeal, but I think the owners are optimistic if they expect punters to pay the same prices charged in larger bars which generally offer much more. From the only in Bangkok file comes the report of what happened at a traffic checkpoint at Asoke this past Friday night. A farang new to Bangkok was going home in an Uber which was stopped by police who breathalyzed the driver and all was well – no sign of any alcohol on the driver’s breath. That’s where it gets crazy. They then breathalyzed the farang passenger who is new in town. He was found to be drunk so they took 1,000 baht off him for being drunk! That is the one and only report I have heard of this happening. The Mad Professor at work this week. Over the years I have really enjoyed following the many characters who are part of the lower Sukhumvit area. Guys like “Voice”, the friendly older Thai guy with the distinctive raspy voice who worked the door of a few Nana Plaza gogo bars. There was the German homeless guy I followed in the column for many weeks who was eventually picked up by Immigration in Pattaya and sent back to Germany; actually, there have been many foreign homeless who have featured in the column. But perhaps they’re not so much the characters of Sukhumvit, but the troubled souls. The real farang characters in Thailand would be the likes of Shark and Glitterman. And then there are the Thai characters like the fake Rolex salesman with the large tumour on the side of his face who has been a fixture on Soi Nana for as long as anyone can remember, the slug (actually, there are a few slugs) and the many others. 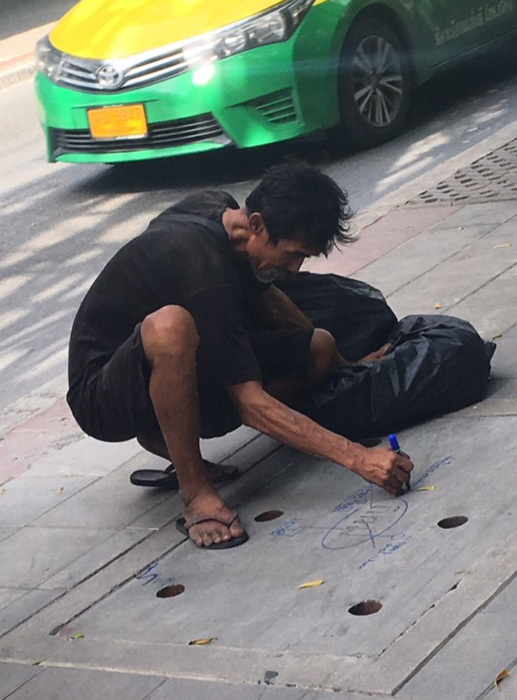 In recent years I have made numerous mentions of the Mad Professor – as I call him – the scruffy Thai guy who scrawls equations and diagrams on the pavement, signs and even some buildings in and around the Asoke area. The shot above was taken by a friend of The Mad Professor this past week, near Makkasan. He, like many of the other Thai characters of Bangkok, is still going strong. Long may he prosper and long may his artwork decorate downtown Bangkok. These folks bring colour to the streets of Bangkok and here’s hoping they don’t go the way of the street food vendors and disappear. As innocuous as they may seem, comments on how busy or otherwise a bar area is have been known to infuriate – YES, infuriate! – some readers who found things different when they visited to how I described them to be. 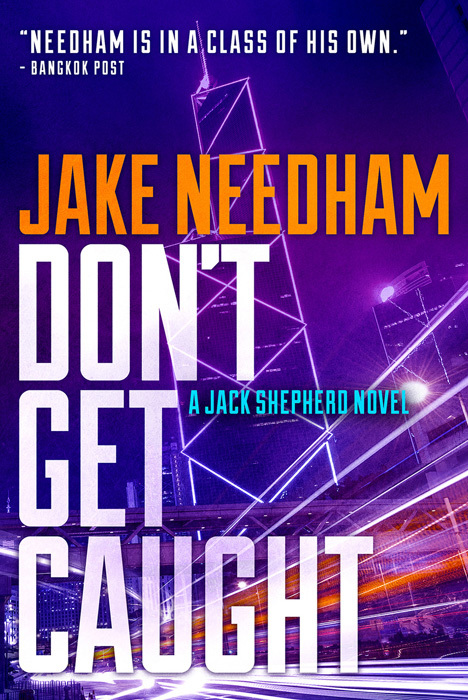 It all comes down to the time of night one visits a bar area, or the time of year. What is busy in September is positively quiet in January) and perception – but it has never ceased to amaze me how there are a few readers can have become so angry when I say a place is quiet and when they visited it wasn’t. 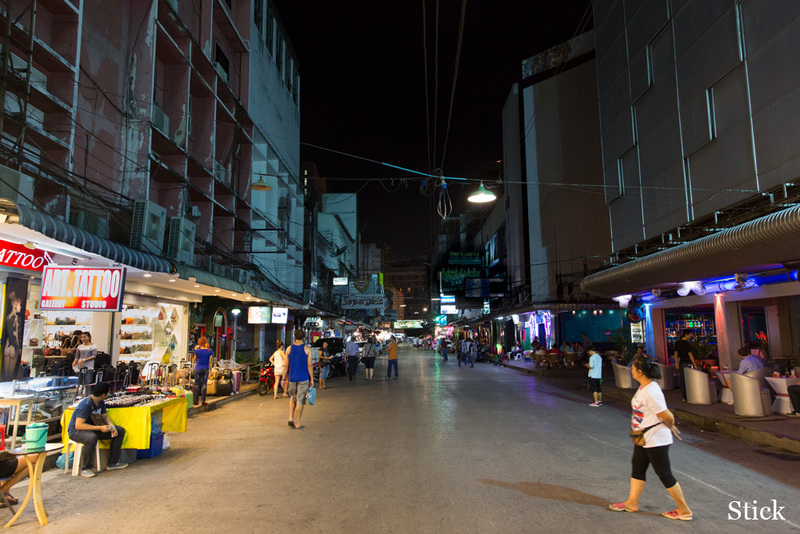 So perhaps I’ll upset some more people this week when I say that word from Pattaya is that the last few weeks Sin City has resembled a ghost town. Some big name bars are in darkness sitting out the low season with a closure order notice and most of those strolling Walking Street are lookyloos. Hardly anyone is spending like there’s no tomorrow. Heavy rain in Pattaya meant one night when the famous Rick James Superfreak came on in Secrets at 8 PM as it does every night to signal the start of the night shift, there were no dancers on stage. Not one! What would former Secrets manager Larry think of that? I have long been of the opinion that the biggest mistake Secrets ever made was letting go of Larry. They should have offered him whatever it took to keep him there. Larry really was that good and many of us, me included, went to Secrets partially to see Larry. A smashing guy – so helpful and someone who truly found his calling as a bar host. Speaking of Secrets, it has a new foreign chef who has introduced a brand-new menu. The food at Secrets was always good so this guy has big shoes to fill. Secrets has made major changes to its popular forum that have not gone down well. The Business section of the forum has gone, wiping out mention of rivals. I get it, but at the same time this will likely just drive forum members across to Pattaya Addicts which is bigger and more popular. Censorship doesn’t work online, even if in this case I do understand why Secrets did it. Popular Walking Street gogo bar G Spot is now called Annabelle’s. It is pumping with many of the girls from Windmill – which is currently serving a 30-day closure – to be found at Annabelle’s. For the best view in the house, it’s recommended you sit towards the back of the bar. The bar staff / bouncers of a certain Walking Street beer bar complex shine laser lights in to people’s eyes and the lens of their camera if they try to take photos from the street in to that bar complex. What a swell place Walking Street is becoming. In last week’s column I recommended the airport branches of Super Rich and Vasu as better options for changing cash than the major bank exchange booths, that is if you absolutely have to change cash at Suvarnabhumi Airport. Do note that unlike the major banks, the booths for Super Rich and Vasu operate limited hours (9:00 AM to 8:00 PM, I believe) which means they won’t be open if you arrive on an early morning or late evening flight. And also following on from an item in last week’s column about horrendously long queues at Immigration when arriving by air in Thailand comes word from one fellow whose flight arrived at Don Meuang at 1 AM and it took him 5 hours (!!!) to be processed by Immigration, collect his baggage and be out of the airport. What a joke for a country which is supposed to welcome international visitors. A military coup has swept over Thailand and the Thai army is holding Thailand’s first female prime minister under house arrest. Her popularity is a threat to army rule so things are about to get messy. There will be a show trial to convict her of corruption and send her to prison. Then, when she’s behind bars, she’s going to be murdered. The only way to save her life is to get her out of Thailand before the trial starts. Shepherd lives in Hong Kong now, but once he lived in Thailand. There was a time when he loved the place, but that went sour and he’s sworn never to go back. On the other hand, the former PM is a friend from way back and you have to help your friends when they need help, don’t you? Besides, how hard can it be? Sneak into Thailand, grab her out from under the nose of the entire Thai army, and keep her alive long enough to get them both out of Thailand again. A piece of cake for the troubleshooter, huh? I’ve been getting my kicks on that Facebook group I wrote about a couple of weeks ago, tuning in when I have some free time to see what the sisterhood is up to. The first thing I have to say is that word of the article did not take long to reach them – and they were not happy! A bunch of emails came in, some of the sisters appalled that I would write such an article and how dare I take screen captures of what they had to say (while it is obviously ok for them to include photos of Western men without said men’s permission.) The group’s status has been changed from a closed Facebook group to a secret Facebook group. I think they are more aware now that posting image files of foreign guys and making comments which are often false is not just morally wrong, it is illegal. My opinion of the group has changed for the worse. At first I thought that what they were trying to do was a good idea and the group was a worthwhile resource for Thai ladies who jump in to the zoo that is online dating in Thailand. But so much of what appears in that group oversteps the mark and seems to be about boasting, inflating their own egos and when it comes to western men, public shaming. I cannot count how many readers have suggested over the years that they’d like to see this site host a database of bargirls so they could check and see if the girl they were supporting was also being supported by anyone else. No way would I ever have done anything like that. What the Facebook group I featured does is in fact much worse than that – they allow the posting of photos of Western men and the disclosure of information about these men that in some cases has been shown to be false and downright defamatory. When the column I wrote became known to that group I received some funny emails. One lady said I had no permission to post screen captures from the group, notwithstanding that I was merely copying what they were doing. And remember, unlike these ladies, I blacked out the men’s eyes to preserve their anonymity. One of the foreign men who was profiled found out about it and hit the roof as what was said about him was entirely false. Another contacted me and we shared an interesting exchange where he explained that what had been written about him was done by a lady he had not had anything to do with nor had he even talked with her online. Photos of many Western men are posted to that group every day along with comments about them or questions to see if anyone knows them. As I said when I wrote the original article, these women would be mortified if their photos were posted online with similar comments made about them. But that doesn’t seem to stop them. Reader’s story of the week comes from Clyde and the title is not a typo, “Suckhumvit“. Thai Immigration is to install electronic passport gates for foreigners with an electronic chip passport. It will be interesting to see how this is implemented and whether those with a visa can use it or not. There has been a surge in North Koreans slipping in to Thailand. The Bangkok Post reported on the order to remove all non-compliant signage from Walking Street. The Bangkok Post ran a nice feature on long-term Bangkok expat and fabulous author, Jerry Hopkins. A Thai teen speaking out about things in the country sparks a barrage of criticism from nationalists. The 4-hour + queues to be processed by Immigration at Don Meuang Airport made the Bangkok Post. Sunbelt Legal Advisors have been answering your legal questions since 2010. I guess over the years they must have answered several hundred questions or so. This was to be the last ever Stickman weekly column but it looks like there will be more. If / when this column does end you would like to get in touch with Sunbelt Legal, you can do so by dropping them an email at : [email protected] You can ask them questions and they will publish them in a weekly review at this address. 1. Are the Thai authorities now broadening the tax base, or are they simply collecting what should have been paid over the intervening years? Is this a new development? 2. Is this tax an income tax or is it a property-based tax? The property is a small townhouse. Better half owns one other property in the same housing estate, in which she lives part-time – her adult son lives there full-time. 3. If it is an income tax, based on assumed rental income, is there a tax-free allowance to which each individual is entitled, even for unearned income – she has virtually no earned income. Sunbelt Legal responds: There are no general property taxes (capital tax on property imposed by the government) in Thailand, but real properties put to commercial use (residential houses not ‘owner occupied’ and commercial buildings) must under the Building and Land Tax Act pay a ‘rental’ tax at a rate of 12,5 % of the annual rental value or the annual assessed rental value, whichever is higher. To answer your second question, it is a rental tax based on renting out the property. And for the third question, “If it is an income tax, based on assumed rental income, is there a tax-free allowance to which each individual is entitled, even for unearned income – she has virtually no earned income?” We have never known of a case of anyone ever getting this tax back. One reason is the government could have appraised the property at a higher rental rate and the probability is high the tax owed with penalties would be higher than what was originally paid. Question 2: I am thinking of buying my girlfriend a piece of land in her name so a house can be built on it. Could you ask Sunbelt what the conveyancing would cost. Obviously I want to he happy that the transaction is legal and there’s no funny business with title. Sunbelt Legal responds: There are many variables on withholding tax, transfer fees, specific business tax and stamp duty depending on years held by current owner and if it’s a corporation owner or individual and, of course, the value of the land. The government fees will depend on the purchase price which is negotiated between buyer and seller. We have helped clients before. We do the title-deed search to check if the land is legitimate and the owner is real, then we can help with registering the purchase at the Land Department from drafting the purchase agreement to registering the purchase. It would be best to contact us at Sunbelt Asia Legal Advisors and we will give you the detailed estimate after asking more questions. Question 3: I am planning to apply for a retirement visa and move to Thailand. A friend told me that I can import (duty-free perhaps?) a used car. After some time in Thailand, then I can then sell the car for some profit. Are there any legal requirements that I have to follow? 1) In case of the person signing the lease moving out early, will I, as the person paying the rental deposit of 2 months’ rent and an ‘advance rent’ (to be used in lieu of the last rental payment, as well as all recurrent rental payments, be able to recover aforementioned rental deposit by myself? 2) If I insisted on signing the lease myself, despite not meeting the owner’s requirement of a work permit, can I insist on a refund of the 5,000 baht deposit? Sunbelt Legal responds: In your first question it is important to see what was agreed upon regarding the lease contract terms in the contract but usually the deposit gets returned to the person who has signed the lease. However, you will not be able to insist on a refund of the lease deposit. Even though the law does not say that foreigners without a work permit are not allowed to sign a lease. It is up to the discretion of the juristic person to decide internally so this means they do not have to accept a lease signed by yourself. Question 5: I turn 50 this year, and have been living in Thailand for the last few years on a marriage visa. I wish to change this once I’m 50 to the retirement option. I’m aware of the financial requirements, but wondered what exactly do I have to do to convert the visa and can it all be done with one visit to immigration? Sunbelt Legal responds: It is possible to obtain a retirement visa extension in country but the original marriage visa extension will need to be cancelled in country at least 15 days before the renewal date. If later than that then you will need to leave the country and come back on a tourist visa which can be converted to an extension based on retirement. This too will need to be done 15 days before the visa expires. Be aware that you must have 800,000 baht in a Thai bank account in your name only or show verified income with a letter from your embassy of 65,000 baht a month. There are a few other requirements and Sunbelt Asia Legal Advisors can walk you through this procedure. I don’t like ambiguity and I really don’t like uncertainty. I don’t like not knowing what is going on when there’s a direct effect on me. I hate not being able to plan ahead. 24 hours ago I thought this was the end, the last column. I had written a long goodbye message outlining everything in detail….but things started happening and now I don’t know what is happening. I never intend to mislead anyone so when I say that I genuinely do not know what is going on or what will happen next, that is the honest truth. What can I say, other than tune in next week for the latest installment in the Stickman journey to, well, who knows where.